This is one of a series of ten images, (PHIL# 9144 - 9153), depicting one of LifeSpan� Furnishing's line of chairs, designed to make sitting down and rising safer and easier, and sitting more comfortable and supportive. 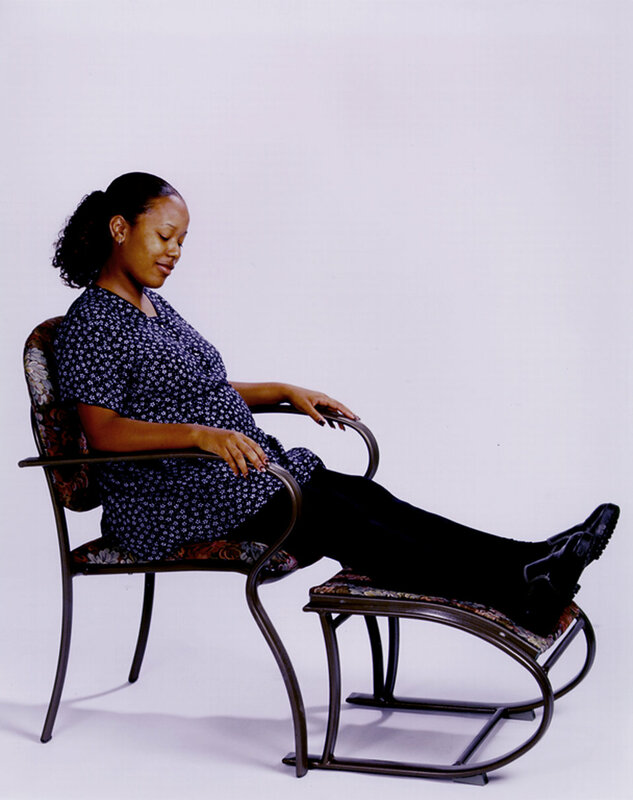 This image showed a pregnant woman who was comfortably seated in one of these chairs, and using the footstool that had been stored beneath the chair. These chairs combined aesthetics and function, and were more comfortable for most people, benefiting those who would care for others, by reducing physical exertion and stress needed when assisting others. The user could take advantage of the extended arms for stability when lowering or rising from a seated position. Close attention was paid to many small details including the non-skid rubber feet, and the elimination of pinch points and sharp edges. The LifeSpan� seating product line included four different designs, all based on an extended arm and leg concept that provided users with better leverage and support.